Creating an Easter Bunny plate is an easy craft that turns into a fun family tradition. Santa gets cookies, the Tooth Fairy gets teeth but what does the Easter Bunny get? Carrots of course! 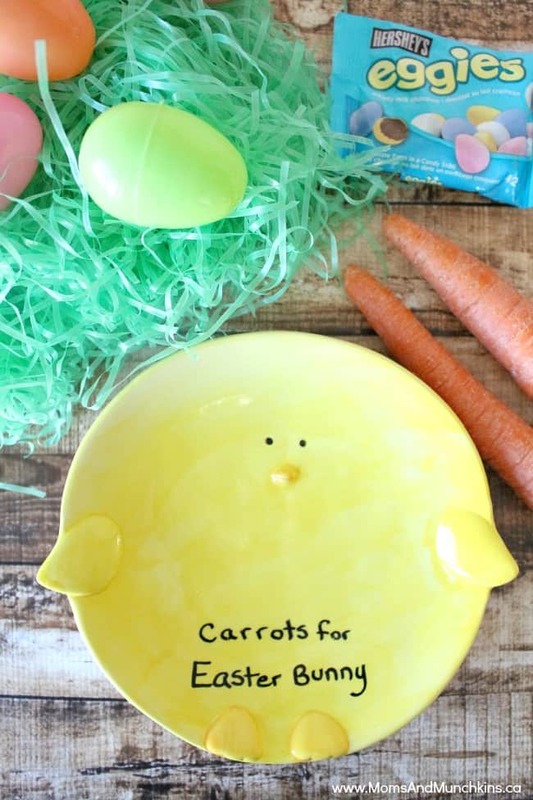 A great way to thank the Easter Bunny for all his hard work is to leave him some carrots on a plate personalized just for him. The plate pictured here isn’t one that I created myself…I just added the words “Carrots For Easter Bunny” on it. When my son is a bit older, I plan on taking him to a ceramics painting studio to let him paint his own Easter Bunny plate (along with a Santa plate for cookies and a reindeer bowl for granola of course!). Do you have a do-it-yourself ceramics painting studio in your city? You & your child can pick out a plate for decorating and then use your creativity to design something special for the Easter Bunny. Remember to put the date on the bottom of the plate as a keepsake. If you haven’t been to a ceramics painting studio before, the staff will walk you through the process when you get there. They’ll have paints, brushes, stencils and other supplies you can use to create your Easter Bunny plate. Once you are done with your painting, they’ll keep your creation a few days to glaze it and put it in the kiln for you. You can then start a new tradition of putting out your Easter Bunny plate & carrots each year for the Easter Bunny. I’m sure he’ll appreciate it! For more Easter fun, visit our Holiday Fun page and scroll down to the Easter section for loads of free printable games, activity ideas, party ideas and more! We also have an Easter board on Pinterest full of fun ideas. Hoppy Easter!